There are a lot of popular birds that are all considered parrots like macaws, lovebirds, cockatoos and more than 350 other birds. Some facts we know about parrots are that they are intelligent, charismatic, colourful, vocal and that they can live a very long life. What they’re best known for is that fact that they can mimic human speech. We have large and powerful curved beaks in order to help us eat the seeds out of our competition. We are one of the most intelligent bird species. We can tap into the minds of our target market and know what they need from us. We have strong legs to help us outlive our competition and jump spaces in the rankings. We have sharp-clawed feet in order to help plant our space in the search engines and use our strong grip to climb and perch there for years to come. Some of us are known for imitating human voices. We can copy your thought patterns and execute plans based on your needs and target market. Our curious and cheeky behaviour allows us to see outside the box and always try new techniques. We are brightly coloured and visible for all the search engines and social media networks to see. We have very few enemies and we don’t play dirty, we show aggression through body language like raising our feathers, using negative eye contact or thrusting with the body. This is enough to deter conflict and aggression. We only use white hat methods and we always follow the search engine optimization rules. One of the most natural things a parrot does in the wild is to scream. In the wild forests at sunrise, the trees come alive with the sounds of squawking parrots. This is their form of expressing themselves. This innate behaviour is used for play, communication and when they need claim their territory. Social interaction is important to all parrots and is practiced with siblings and groups of young broods. They live in flocks and communicate with loud verbal squawking and screeching sounds. They maintain constant contact with their flocks and require hours of daily social interaction. Being quiet and independent is not their thing. Just like saying nothing on social media and having no fans isn’t our thing. 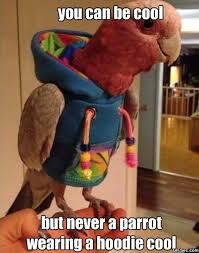 If parrots are deprived of stimuli, they are slow in development and will not learn new behaviour. They have a need for environmental enrichment in order to stay happy and stimulated. When kept as pets, parrots will scream to draw attention because they are not feeling enriched or stimulated. We constantly need to be surrounded by the best marketing education that is out there and continue to tweak and improve our methods based on the changing search engine algorithms. Most parrots are monogamous. They are able to form strong bonds that last for life. We are determined to help your business grow and will continue to work hard to keep a long lasting relationship with your business.